Why Save $100 Billion, When You Can Save $500 Billion? Welcome to our world—the world that nonprofits are, and will be inhabiting, for the next few years. 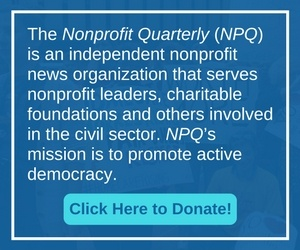 This issue of the Nonprofit Quarterly has attempted not only to bring to the surface many of the contextual issues that may challenge us in the near future, but has also tried to suggest actions that we may all wish to take. There are a number of jewels in this issue—articles that urge us to greater clarity in our purposes and values, and to greater influence in the future of this country. We have also, for the first time, included a Letters to the Editor section—there is a link between these two things. The letters are drawn from the overwhelming response to our May e-Newsletter, dealing with the general suppression of dissent and the associated threat to civil liberties—and the connection between that threat and the erosion of our right to exist as a sector, and as individual nonprofits. We have reprinted that e-Newsletter here. A “social contract” providing for justice, equity, and opportunity has been a cornerstone of our national aspirations from the beginning. Nonetheless, author Jeff Madrick explains, deepening disparities in wealth and political influence signify that it’s time to stir up a fuss. The Nonprofit Sector’s Downward Slope: How Steep and How Long? Even if the economy rebounds tomorrow, nonprofits can expect to stay in recession much longer. Jon Pratt surveys the wave of cutbacks in major revenue sources, from state funding to foundation grants, and predicts that long-term recovery will be a matter of discerning trends, assessing options and anticipating opportunities and obstacles. Most organizations are operating with little or no cushion in the current financial crisis, but Denise Williams advises that strategies be integrated into everyday management practices. This involves deep, honest decisions about ways to scale back, maximize productivity, or resolve to close up shop all together—if that makes more sense. Revenue is so unstable in these times, it’s especially important to monitor your cash flow. Author Murray Dropkin offers a complete refresher on how to budget a surplus, establish policies and train your staff with such fiscal sense in mind. People with less experience in this area or smaller organizations might find this especially helpful. How should foundations understand their charitable missions in hard economic times? Should they increase their payout in response to dire and immediate local circumstances, or focus on asset-building and maintenance in anticipation of future need? NPQ asked three foundation executives for their insights into grant levels, funding emphases and policy advocacy. With the recent proliferation of new small foundations, we asked Charles Scott, former CEO of the Association for Small Foundations, to advise how to develop fundraising relationships with this community. Take note, it’s quite different from large foundations. “Visitor traffic can be a treasure trove of information about the usage patterns of a Web site,” says Internet strategist Michael Stein. The trick is in how to tease enough meaning from this mountain of raw data to make the most from your Internet presence.